The smallest of the split-rig boats, the Dabber has all the energy and quality of finish as her sisters. A compact 4.72 sq mtrs (15ft 6″ ) the Dabber carries an extremely useful 10.96 sq mtrs (118 sq .ft ) of sail with the help of a bowsprit and bumpkin, she is beautiful to handle. When the wind drops, a 2-4 hp engine will drive the Dabber without any difficulties. Or you can use the pair of oars from either or both positions. The Dabber is a surprisingly roomy family craft, and she has plenty of storage space. The C.E. Mark approved stability and buoyancy, a safety feature of all our boats. The Dabber can be covered and left on a mooring or hitched up behind a car and towed very comfortably. With a Dabber flexibility is the word. For a full specification plan please click HERE. For pricing and options click HERE. 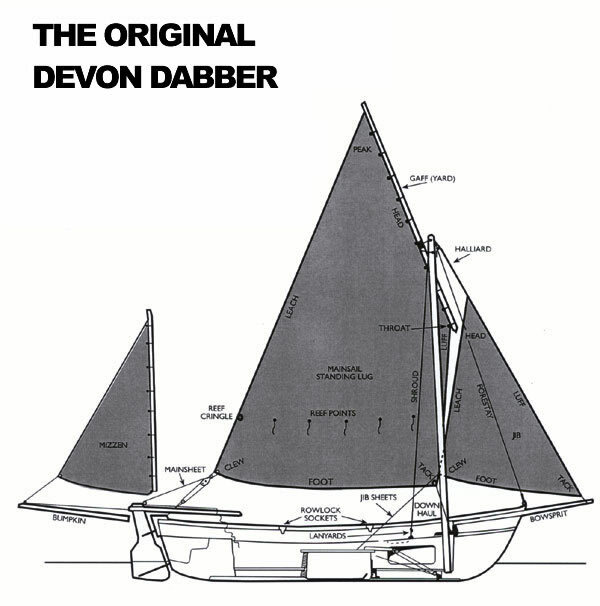 This boat was originally called the Drascombe Dabber and then re named to Original Devon Dabber.